Poetry Ireland has teamed up with its Dublin 1 neighbours to create a unique shopping experience at its beautiful Georgian premises at 11 Parnell Square East, Dublin 1. 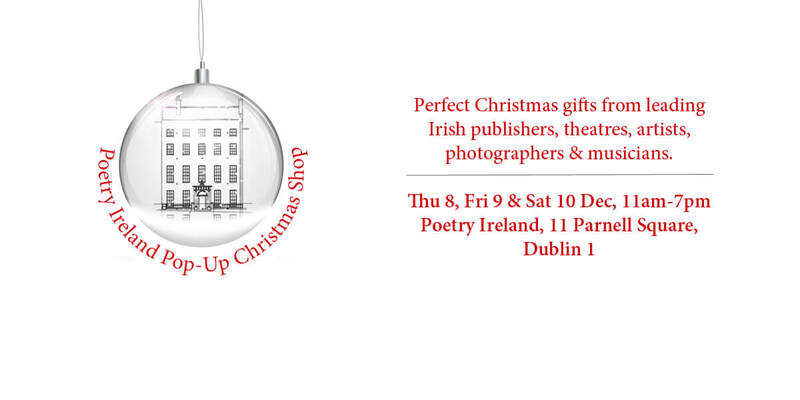 Expect an Aladdin’s Cave of literary-leaning gifts and creative goodies from leading Irish publishers, theatres, designers, photographers and musicians. There’ll also be mulled wine and festive treats to nibble on while you browse. So come along, escape the hordes, and support local artists this Christmas. Products on offer will include gorgeous publications, gift memberships and subscriptions, art and photographic prints, Christmas cards and albums from Poetry Ireland, Children’s Books Ireland, Irish Writers Centre, Irish Heritage Trust, The Landmark Trust, Abbey Theatre, The Ark, Blackstaff, Niamh Flanagan, The Gallery Press, Gate Theatre, Gorse, Little Island, Lisa Lambe, The O’Brien Press, Paula McGloin, The Moth, Hugh O’Conor and more. Vocalist Lisa Lambe will also perform in the space on 10 December at 1pm, so Saturday shoppers will be in for a treat! There will also be a prize draw to win tickets to the Abbey Theatre, in aid of SAOL Project.